Google's long awaited expanded text ads has finally arrived. Google has designed these ads keeping the advertisers and the mobile-first world users in mind. The long awaited expanded text ads have finally arrived, but are we ready? Google has designed these ads considering both, the advertisers and the mobile-first world users in mind. So, what exactly has changed and how can it help us? 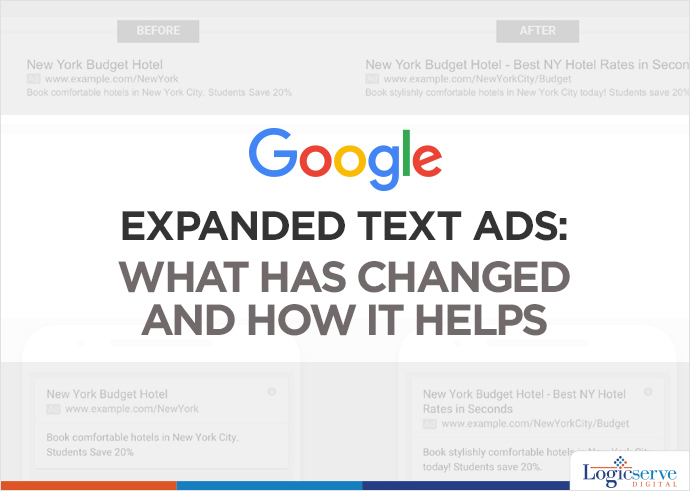 Before, we answer this question let’s first understand what are expanded text ads. Consider yourself as an artist who is painting on 1”x1” canvas for 15 years. Suddenly, someone hands over twice the size of the canvas. Would you fill up the extra space with more clouds and land? An ingenious artist would use up the space to bring up a stunning and all comprehensive landscape. Likewise, the expanded text ads gives you the freedom to flex your creative PPC muscles by exceeding the character limit. Instead of 25-character headline, we now have two headlines with 30 characters each i.e., 60 characters! It is a wonderful opportunity to have a desired call-to-action. Both headlines will appear on the single line (as shown on the left hand side of the image). However, the second one might come after a line break or Google might even truncate the second line, if required. Languages such as Japanese, Korean and Chinese having double-width characters are allowed to have 15 characters. This addition is sure to add up to the effectiveness of the ad. Remember the canvas; its size has increased by 14%! The 70-character limit for the description has been extended to 80-character. Often we find it impossible to utilize the 35 character in description line 1, and forced to move the long phrase or word to the next description line. This extension in character limit for description comes as boon for us, isn’t it? Check out the below given image for more clarity. In the standard text, we have less character limit for description line, however in the expanded text ad we have much better call to action due to extended character limit on a single line. No need to enter a display URL to match the final URL domain. Adwords will pick the domain from your final URL and show it as your display URL. Well, you have another option of having path fields with 15-character limit. It will be a part of your ad’s display URL, positioned after the website’s domain. This is how the ads will look in Adwords interface. Google recommends using path text, as it will give the users a better idea of where they will land on your website. The major benefit of expanded text ads is the increase in CTR (Click-Through-Rate). It makes sense, as your ad will have more space in search engine results with detailed information and call to action.